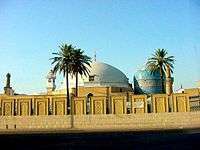 The Kubrawiyya order (Arabic: سلسلة کبرویة‎‎) is one of the Sufi orders and way that claims to trace its direct spiritual lineage and chain (silsilah) to the Islamic prophet Muhammad, through Ali, Muhammad's cousin, son-in-law and the First Imam, via Imam Ali raza. 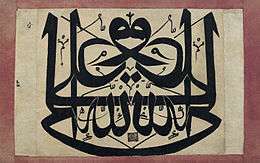 In contrast, most other Sufi paths trace their lineage through Ali.The Kubrawiya order is a Sufi order ("tariqa") named after its 13th-century founder Najmuddin Kubra.The Kubrawiya Sufi order was founded in the 13th century by Sheikh Nadjm ed-Din Kubra in Bukhara in modern Uzbekistan. The Mongols had captured Bukhara in 1221, they committed genocide and killed nearly the whole population. Sheikh Nadjm ed-Din Kubra was among those killed by the Mongols. The tariqah is also known as Firdausia Silsila and is popular in Eastern India, Bangladesh and Mauritius. Further more Aladawla Simnani has also enumerated and eulogized the virtuous qualities of Ahl al Bayt and has included the discussion on the description of the Ghadir-e-Khum event affirming the successorship of Ali. He has also presented the description of a true Shi'a and the difference between a nominal Shi'a while regarding he Sufis to be the true followers of Ali in his book. In Iran the Kubrawi order split into branches after Mir was succeed by Khwaja Ishaq Khatlani. Difference had arisen between the two claimants to successorship of one group which called itself the Nurbakshia group comprising the supporters of Nurbaksh and other the supporters of Barzish Abadi. The Noorbakhshiya has emerged in the 15th century in Iran as a branch of the kubrawiya Sufi order A similar controversy has later developed about the religious affiliation of Sayyid Muhammad Noorbakhsh who had been a disciple of Hamadani’ Shi’a, principal successor Khwaja Ishaq Khuttalani, and who became the founder and eponymous of a new branch of the Kubrawiya. Noorbakshi doctrines were preached in Kashmir and Baltistan in the early 16th century by Mir Sham ud-Din Iraqi himself a disciple of Sayyid Muhammad Noorbakhshis's son and spiritual heir, Shah Qasim Faidbakhsh. This order has been attributed to Syed Abdullah Barzish Abadi and it spread during first years of Safavid dynasty first in Khurasan then in Sheraz.